You'll be £4.99 closer to your next £10.00 credit when you purchase Lawrence of Arabia's Secret Air Force. What's this? Individual diaries from both world wars continue to be discovered and published, to our collective benefit. Their personal narratives offer a new perspective on major events and in some ways provide the freshness and colour that are so often missing from better known and, generally, better crafted accounts. "Lawrence of Arabia's Secret Air Force" is a fascinating account of the life of a JNCO serving with No 14 Sqn in the Sinai during the First World War. This is a story that deserves to be told and sheds new light on a campaign that continues to fascinate. The best bits are certainly the original diary entries. They provide an important insight into the life of a technical NCO within the Royal Flying Corps. Too few such accounts have survived and this is an excellent addition to the corpus. I would recommend the book as an important addition to the story of flying operations in the First World War. Designated the task of keeping the more elderly aircraft airworthy in the most formidable conditions of the Arabian desert; George Hynes was an aircraft mechanic, who personally encountered Lawrence of Arabia on numerous occasions, and even maintained contact with with him post-war. This diary recounts The Royal Flying Corps' 14 Squadron X Flight, which was ascribed the duty of providing tight aviation support to Lawrence's steadily advancing desert army. With prescribed missions of attack, surveillance and exploration, bombing, and liaison; for all of which the deeds of flights were kept secret, Hynes recites a clear insight into the endured conditions, insurmountable problems, and the actions that were implemented as he followed the army's progress. Supported with the perspectives and recollections of unfolding battle scenes, the Flight's weekly operational records, and other additionally compelling background information, Hynes diary provides a truly engaging read. 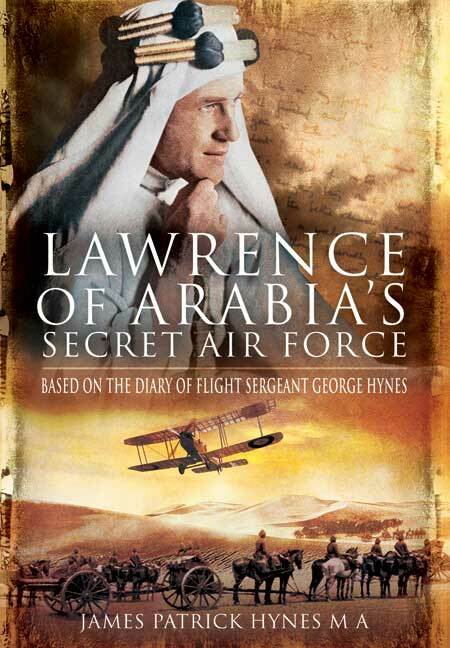 Lawrence of Arabia's Secret Air Force is the story of George Hynes, an aircraft mechanic attached to X flight in Aqaba. The dry and terse accounts in the official war diaries were carefully written in difficult conditions and it is regrettable that the same care was not applied to the transcriptions used for this book. I noticed several errors. Captain Furness-Williams was not in the Turkish garrison of Ma'an on 4 March 1918; he was at Aqaba. Captain Siddons wrote his report for the week-ending 10 March in 1918, not 1928. The description of the Ma'an landscape is unrecognisable to anyone who has actually been there. And so on. However, the errors have to be endured for the comprehensive and detailed first-hand accounts written by George Hynes. These give an astonishingly detailed view of what life was really like, not just the hardships of desert warfare, but also the lighter moments that made life bearable. One such account is of the Commanding Officer flying from Aqaba to Suez and back on Christmas Day in 1917, with crates of beer strapped to the bomb-racks of his machine for the men and bottles of whisky for the officers. This is a book based on the diary for Flt Sgt George Hynes who was serving with X Flight, a detachment of No.47 Squadron. As such, it is an interesting memoir of his time in the desert maintaining the handful of aircraft operating on the right flank of the British and Commonwealth army that was advancing up through Palestine to Lebanon and Syria. It is difficult to connect X Flight to Lawrence as it was engaged in reconnaissance and bombing to the east of the Jordan and while if provided transport on occasions to Lawrence, its operations were defined by the RFC and RAF and were not restricted only to supporting the Arab army that eventually won the race to be first into Damascus. George Hynes seemed to be worth his weight in gold by keeping X Flight aircraft in the air, being a very good mechanic. There was not too much gold available to him as the RFC accountants seemed to have lost track of X Flight and a lot of pay never arrived. Pursuing the question after the end of the war met with a stone wall and George was short of several thousand pounds. He met Lawrence a couple of times and after three years in desert conditions, the war ended and he was shipped back to the UK, first in a crammed ship to Taranto where, after waiting for a train to take them to the Channel ports, the other ranks were crammed into freight cars and chugged across Italy and France to Cherbourg for twelve days in freezing temperatures with little food. Some passengers did not survive the trip and after waiting for a cross-channel ship, he eventually arrived at Blandford Camp where personnel awaited posting. Not surprisingly, he did not choose to re-enlist in the RAF! The buzzwords in the title, Lawrence and Secret, seem to have been for publicity purposes as X Flight was not secret and had only a passing connection with Lawrence.